The women’s golf team will send a very experienced team to this week’s 54-hole OVC Championship, at the 6,043-yard, par-72 Schoolmaster Course of the Robert Trent Jones Golf Trail at the Shoals in Muscle Shoals, AL, with the squad being comprised of three seniors, a junior and a freshman. Senior twin sisters Taylor and Ashton Goodley will be making their fourth trip to the OVC Championships, both looking to add to careers that have included All-OVC honors, while fellow senior Reagan Greene and junior Meghann Stamps hope to improve on their two Top-10 finishes from a year ago. Rounding out the Govs squad will be freshman Taylor Dedmen, who will be slotted as the Govs No. 1 player in the tournament and leads the team this spring with a 76 strokes per round average. 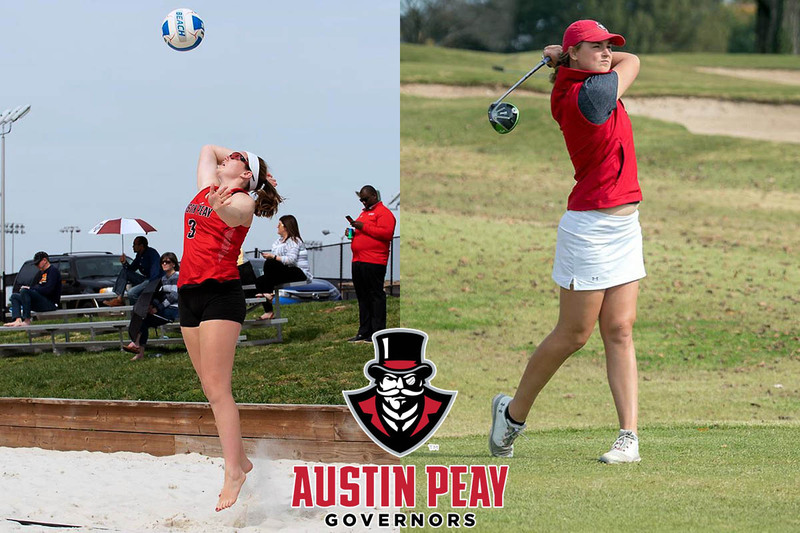 The Govs will be joined in the OVC Women’s Golf Championship by two-time defending champion Murray State, Belmont, Eastern Illinois, Eastern Kentucky, Jacksonville State, Morehead State, Tennessee State and Tennessee Tech. Austin Peay is scheduled to begin play at 8:50am, on April 15th, paired with Morehead State and Belmont in the opening round. For beach volleyball (15-13, 4-4 ASUN), after playing its first two seasons without a conference affiliation, they joined the Atlantic Sun Conference and earned a spot in the conference’s championship tournament in DeLand, FL, after posting its first winning season in the program’s three-year history. The Govs, who will be joined in the tournament by Stetson, North Florida, Coastal Carolina, Florida Gulf Coast and North Alabama, enter the double-elimination tournament as the fifth-seed and will open play versus No. four-seed Coastal Carolina (19-9, 8-0 ASUN), at 7:30pm, on April 18th. The Govs were led this season by the pairing of junior Jenna Panning and sophomore Haley Turner, who finished the regular season with a 14-7 record together — including a 9-3 mark as the No. 1 pairing — after opened ASUN play with four straight victories at the No. 2 and 3 pairings. They also paced the team in individual victories, as both finished with 18-10 individual records. Fifth-year transfer Ciera Koons and sophomore Brooke Moore also enter the ASUN Championship playing well having won 11 of their last 15 matches after taking over the No. 2 pairing in the final week of the season.